Welcome. You can shop here for poster prints and other products, and we will ship your order. Or you can order here and pick up your order at The Copy Centers, 131 S. Salina St., Syracuse, without paying shipping and handling fees. You can also shop for poster prints at the stores listed at the end of this guide. Posters, Syracuse: Special features a single poster, or selection of posters, offered at a 10 percent discount. The selection changes weekly. Posters, Syracuse: Current features the 16 prints from the current poster series. Posters, Syracuse: Favorites features a selection of popular prints from past years' poster series. Posters, Syracuse: All By Year features our complete archive of posters, organized by year. Posters, Syracuse: Samplers features samplers of the poster collections from each year. Posters, Syracuse: Indy Artists features Syracuse-themed posters by independent artists, designers and typographers working in Syracuse. Posters, Syracuse: Literary features posters from the Rosamond Gifford Lecture Series, autographed by the featured authors. Books: Booklets features handmade booklets of haiku selected from our archives. 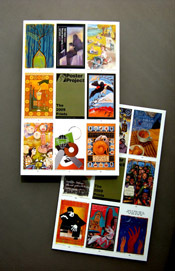 Books: New & Used features books about haiku, graphic art, poster art and public art. Cards: Haiku Cards features note cards with haiku and a graphic ornament as well as custom cards for your poem or text. Cards: Note Cards features 5 x 7-inch note cards based on popular posters from our archives. Cards: Postcards features postcards based on popular posters from our archives. Swag features canvas totes and other fun products for flaunting your love of civic art. Poster prints are 11x17-inches, printed on heavy weight (90-pound) Mohawk cover paper. We package each print with a cardboard stiffener in a clear plastic sleeve. An information page with photos of the artist and poet, and hand-written comments from each. A coupon for a framing discount at The Art Store, 935 Erie Boulevard East, Syracuse. Shipping service: We package your order in a flat 13x18-inch cardboard mailer and ship it via U.S. Postal Service. You can choose standard service or express service. Via standard service, your order travels by First Class or Priority Mail, and arrives within one to four days of the ship date. We ship standard orders within three business days of receiving them. Via express service, your order travels by Express Mail and arrives within two business days. International service: This site does not handle international orders, but we can fill them by special arrangement. E-mail a basic request to jim@posterproject.org, and include your phone number. We will explain the arrangements. Your order will travel by Priority Mail and usually arrives within six to 10 business days of the ship date. Confirmation and tracking: After verifying payment, we will e-mail you a receipt. Through the Postal Service tracking system, we can confirm that your order has reached its destination. 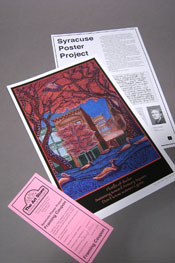 If a problem occurs, e-mail a note to jim@posterproject.org. We will promptly respond. Payment: All on-line orders must be paid by credit card. We accept Visa, Master Card, American Express and Discover. Sales tax: Orders shipped to New York State incur an 8 percent sales tax. In New York State, sales tax applies to the order and the shipping and handling costs. Returns: All poster prints are produced on demand and are not returnable. Please be aware that printed colors will come close to colors portrayed by a computer screen, but may not match. Security: The information you submit is protected during transmission by Secure Socket Layer encryption (SSL). To fulfill your order, the Poster Project contracts with The Copy Centers, a full-service printing and copy service at 131 S. Salina St., Syracuse. The staff charges your credit card, prints and ships your order, then eliminates the credit card information.